Baobab, Adansonia digitatais a majestic tree revered in Africa for its medicinal and nutritional value. Baobab leaves and fruit pulp are two key parts daily used to treat various ailments such as diarrhoea, malaria and microbial infections. Baobab fruit pulp used for beverage, nectar, syrup, etc. is an excellent anti-oxidant due to its vitamin C content which is ten times higher than the vitamin C content of oranges and thirty times that of kiwi pulp. Baobab leaves traditionally used as vegetable, are prized and recommended for their exceptional content in iron, vitamin A, Calcium, and good quality proteins. 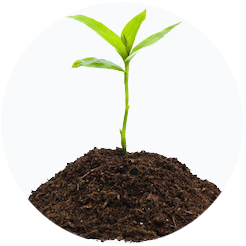 Baobab has numerous biological properties including antimicrobial, antiviral, anti-oxidant and anti-inﬂammatory activities amongst others. Due to this nutraceutical importance, the European Commission has recently authorised the import of baobab fruit pulp as a novel food and it was approved in 2009 by the Food and Drug Administration as a food ingredient in the United States of America. Baobab is an important commodity which is integral to the livelihood of rural communities in Africa and particularly in Benin communities. The global demand for baobab raw material by the food and beverage, and nutraceutical industries is dramatically increasing thereby increasing the commercial value and importance of this tree but at the same time jeopardizing in some areas the species natural populations. It is however unfortunate that this market opportunity in Benin is still underexploited, in spite of its high potential to improve livelihoods of rural poor farmers. One of the major reason is linked to the fact that value chains of baobab pulp and leaves are not well structured, fluid, and some stakeholders lack some key capacities. Thanks to two recently RUFORUM funded projects (RU-GRG 125 &135), knowledge products were developed on environment-friendly cultivation of baobab seedlings for leaves production, and food-to-food fortification using baobab pulp to fight infant malnutrition. However, locally-adapted technical guidelines for early baobab fruit production for pulp is still lacking. Post-harvest handling remains a major constraints for adding value to baobab leaves and pulp, and derived products for the benefit of poor rural farmers, especially women who are mainly engaged in baobab related activities. Objectives and approach—this project aims to combine both participatory research and capacity building actions to set long lasting valorization scheme for the African baobab at a national scale in Benin. 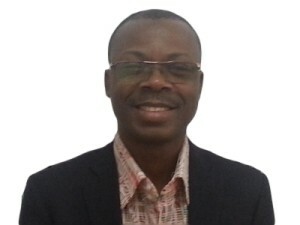 Specifically, the project will [i]-diagnose baobab leaves and fruit pulp value chains, [ii]-organize actors involved in baobab leaves and fruit pulp value chains (VC) into a platform and networks to ensure long lasting connections, [iii]-develop market driven technological packages for baobab leaves and fruit pulp and derived-products(1 – early baobab fruit and leaves production, 2 – postharvest handling techniques, 3 – safety and quality standard of baobab based derived-products) to allow baobab cultivation and supply the market with safety and quality baobab derived-products, [iv]-establish pilot incubators for baobab leaves and fruit pulp valorization in the project areas, [v]-scale-up added-value novel technologies at country level, and [vi]-develop an advocacy plan for better integration of baobab products in food and nutrition security strategies but also as agro-business opportunity at national level. The project is prepared such that it shifts from traditional conservation and poverty alleviation approaches to the use of a business-oriented approach with pro-poor growth strategy. Partners of the project include public research institutions (LABEF, LEA, LSA), local communities, three Technical Vocational Education and Training (TVETs) institutions, Non-Governmental Organizations (Cidev-ONG, Jura-Afrique, Oe-Benin), and one private for-profit company (“La bourgeoise”). Outputs to be delivered—seven main outputs will be delivered as follow: [i] baobab leaves and fruit pulp value chains diagnosed and mapped in Benin, [ii] operating platform and networks actors of baobab leaves and fruit pulp value chains, [iii] market driven technological packages developed for baobab leaves and fruit pulp and derived-products, and stakeholders capacitated on these technologies, [iv] operating pilot start-up incubators for baobab products valorization in the project areas, [v] added-value novel technologies for baobab leaves and fruit pulp and derived-products scaled up country level, [vi] 1 PhD, 5 M.Sc, and 30 TVET students trained for impact-oriented research, and [vii]maintenance of collaborative working relations among researchers, farmers, market actors, national agricultural research and advocacy institutions, and government, TVETs. Potential impacts— The expected direct project reach includes 300 farmers, 60 small and medium-sized enterprises involved in baobab leaves and fruit pulp and derived-products value chains, and 36 students. The targets groups include Young, Women, farmers associations, TVETs, NGOs, Students, and Researchers. The project seeks to promote and nurture long term partnership between public research institutions, local communities, TVETs, NGOs, and private for-profit companies. Beneficiaries of the projects include farmers producing baobab leaves and fruit pulp, baobab leaves and fruit pulp processors, private for-profit companies, rural communities, TVETs, and final consumers. The project envisages to improve actors’ revenue through better organization of the value chains while contributing to food security and nutrition of households as well as sustainable conservation of baobab trees. Accordingly, through the development of the baobab value chains, this project is expected to stimulate the local economy through the development of business aspects of farming, postharvest handling and processing of baobab products. 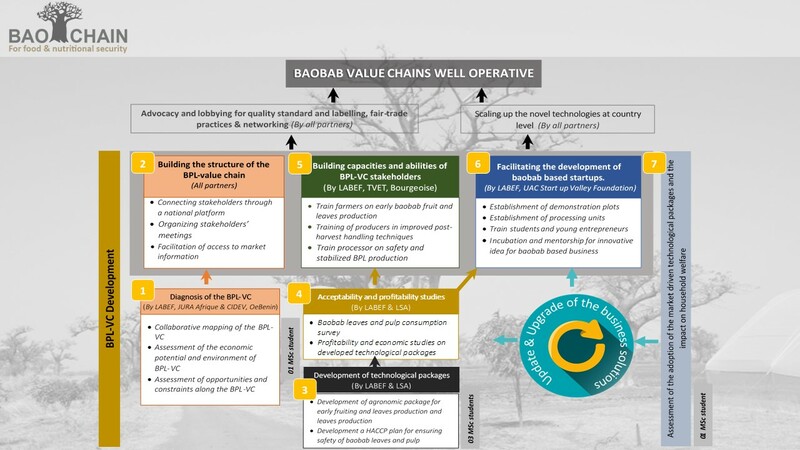 Some expected development milestones include: [i] stakeholders along the baobab value chains in Benin are connected, [ii] supply of raw materials (baobab leaves and pulp) is increased while pressure on wild population of the species is reduced, [iii] the safety and standard of baobab pulp and leaves are improved, [iv] new enterprises for valuing baobab products were created, [v] maximum of the add value generated by the chain benefits the local people (smallholders’ and processors), and [vi] livelihood of baobab smallholders’ farmers and processors is improved. Through its objectives, the project strategically contributes to the fulfilment of the RUFORUM’s vision and aligns with its vision as well as the MasterCard Foundation mission. By contributing to agricultural diversification, safety baobab products, and improving farmers’ revenues with emphasis on youth and women, the project also aligns with the Malabo declaration of African Union on accelerated agricultural growth but also the UN-SDGs (end poverty, zero hunger, good health and well-being, and gender equality).